Amanda Jane Lieto is an entrepreneur and is passionate about women’s economic empowerment and entrepreneurship. She studied accountancy at the University of Zimbabwe and Masters in Public Policy and Governance at Africa University. She won the global student entrepreneur award and if the founder of Elegant Grind a young women’s economic empowerment organisation with chapters in Harare, Bulawayo, Zambia and Uganda. She is also part of the Graca Machel Trust Women in Finance network working towards advancing women’s financial inclusion in Africa. 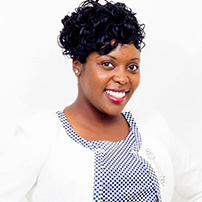 She has taken part in consultancy work involving participation of women in agricultural value chains in Zimbabwe. She runs a company called Wananchi which provides investment, growth and strategy consultancy services to start ups and corporates. She is developing towards becoming an expert in financial inclusion, entrepreneurship and governance whilst she studies her PHD.